Sweet, caramelized…vegetables? You bet! Those are two words I would definitely use to describe the flavor of roasted vegetables. Roasting, my favorite cooking method by far, is incredibly easy and versatile. From asparagus to zucchini, vegetables are transformed from crunchy, sometimes bland tasting foods to entirely new fare, all with the use of a little oil and high heat. Sweet, caramelized…vegetables? You bet! Those are two words I would definitely use to describe the flavor of roasted vegetables. Roasting, my favorite cooking method by far, is incredibly easy and versatile. From asparagus to zucchini, vegetables are transformed from crunchy, sometimes bland tasting foods to entirely new fare, all with the use of a little oil and high heat. Although typically reserved for cooking beef and poultry, roasting is an ideal way to up your vegetable game, as it caramelizes the naturally occurring sugars in the vegetables, rendering them sweeter and yet even more savory. Thick, root vegetables become creamy, while tender vegetables melt in your mouth; all with very little work on your part! This cooking method is ideal for busy people, individuals looking to add more vegetables to their diets, and/or those with little culinary interest or experience (so… everyone)! To start, wash and prep your vegetables. 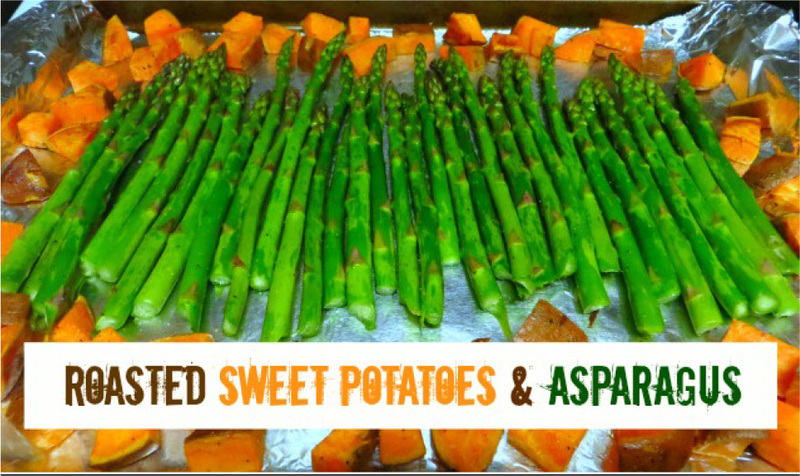 The sweet potato will take slightly longer to roast than the asparagus, so that’s where we will start! Give your sweet potato a good rinse and chop into small, 1 in. wedges (for full washing and chopping techniques, visit this post here). The smaller you chop your root vegetable, the faster it will roast and vice versa. Coat your wedges with 1 Tbsp. canola oil (this can be done on the baking sheet, a bowl, or in my case, on the cutting board) and lightly season. 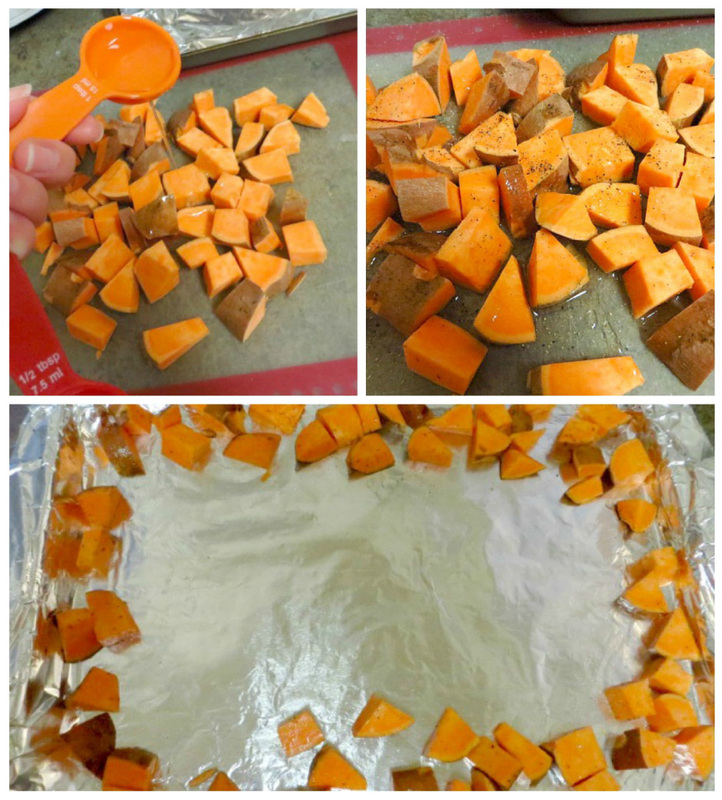 Arrange in a single layer on a tin-foil lined baking sheet that has been prepared with non-stick spray. Place in pre-heated oven (375⁰ F) for ten minutes. While the sweet potatoes get a head start, let’s work on the asparagus. Start by washing the crisp, bright green asparagus spears under warm running water. To prep, snap off the woody stem on the bottom of the asparagus. 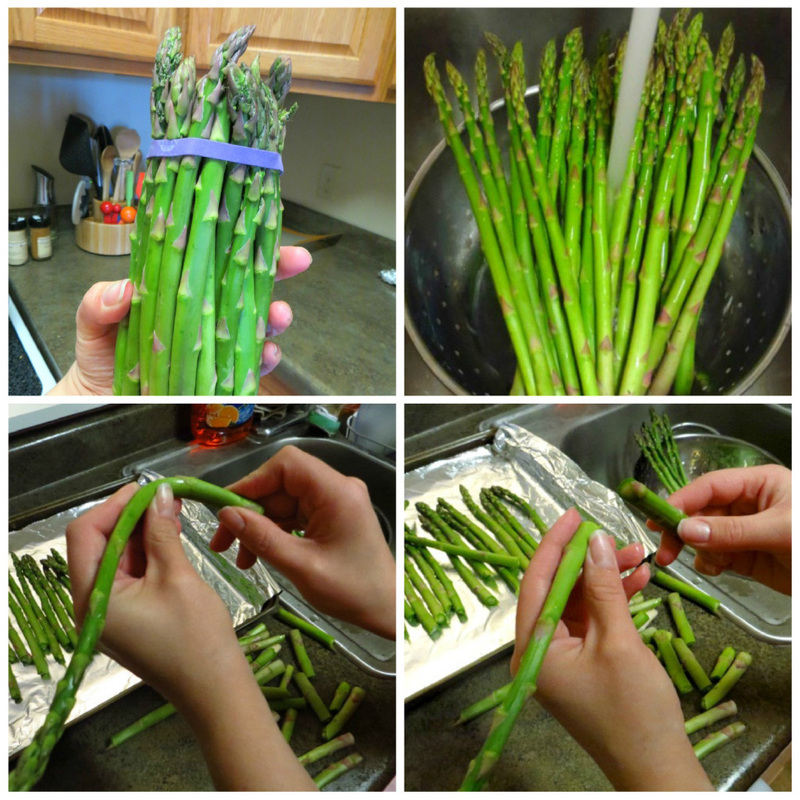 This is easily done by flexing the asparagus until the bottom, woody part snaps off! Very easy and a great job for kids. Next, lightly drizzle 1 Tbsp. canola oil over the asparagus and season (with whatever seasoning you prefer; I used salt and pepper). 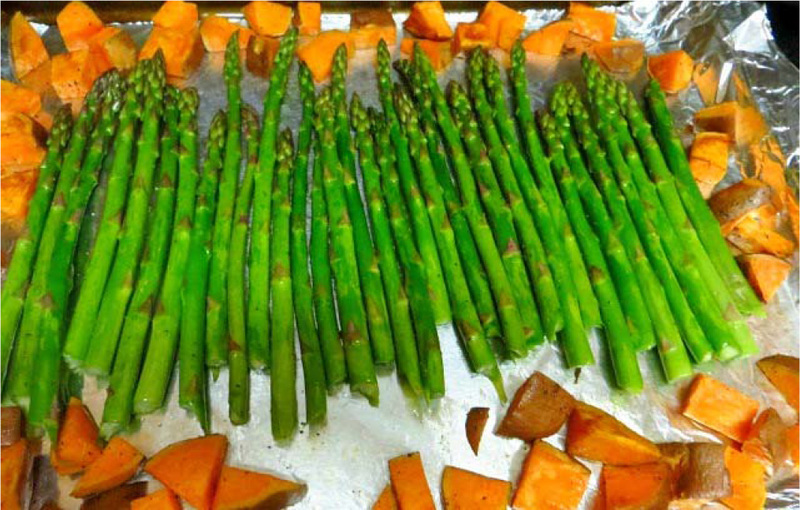 Remove your sweet potatoes from the oven and arrange the prepared asparagus in the middle. At this time, turn your sweet potato wedges over to brown both sides. 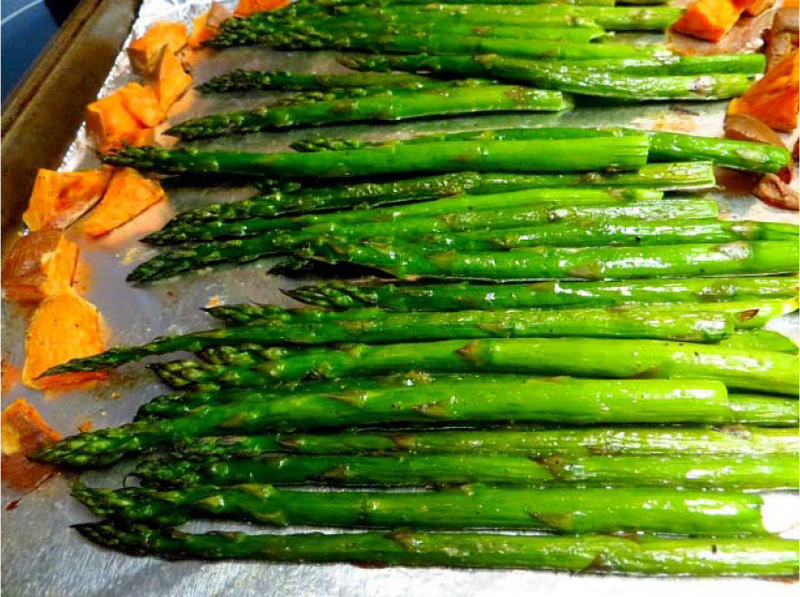 Finish baking the vegetables for another 8-10 minutes or until soft (sweet potatoes) and tender/crispy (asparagus), turning the asparagus once halfway through. 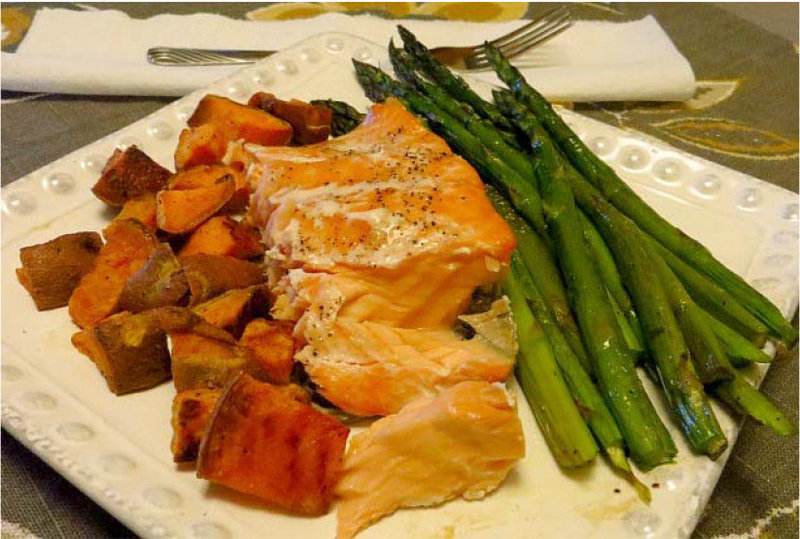 Roasted vegetables make a fantastic addition to any meal, but especially baked salmon! Note, if you’ve never made baked salmon, you should! It’s amazingly simple and full of flavor. Simply place a fresh fillet of salmon skin-side down in a tin-foil lined baking sheet that has been lightly sprayed with non-stick spray. Season lightly with salt and pepper. Bake for 15-20 minutes at 375⁰F or until internal temperature reaches 145⁰F. Delicious dinner made simple. What’s your favorite vegetable to roast? Directions: Preheat the oven to 375⁰F. Snap the woody ends off the asparagus and spread in a single layer on a baking sheet. Drizzle the asparagus with oil, and lightly season with salt and pepper; roll to coat thoroughly. Roast until lightly browned and tender, about 8-10 minutes, shaking the pan halfway through to turn the asparagus. Directions: Preheat the oven to 375⁰F. Chop the sweet potato into small, 1 in. pieces and spread in a single layer on a baking sheet. Drizzle the sweet potato with oil, and lightly season with salt and pepper; roll to coat thoroughly. Roast until lightly browned and tender, about 18-20 minutes, turning the wedges halfway through to brown both sides. Directions: Preheat the oven to 375⁰F. Line a baking sheet with tin-foil and lightly spray with non-stick spray. Place salmon fillet skin side down on the lined baking sheet. Season lightly with salt and pepper. Bake for 15-20 minutes at 375⁰F or until internal temperature reaches 145⁰F.